The highly anticipated premiere of LARPs The Series: Season Two is almost upon us! The award-winning series, named Best Web Series at FilmQuest 2014 and Best Independent Series at GenCon 2014, will return to Geek & Sundry for a second season in September following their hugely successful Indiegogo campaign. Season Two will feature 10-extended length episodes that will air weekly on GeekandSundry.com. To gear up for the premiere, the Geek & Sundry crew will host the cast of LARPs: The Series on Saturday, August 29 for a Season One watch through, beginning at 4pm PST on Twitch.tv/geekandsundry. The director Julian Stamboulieh, producer Benjamin Warner, and cast leads, including Scott Humphrey, Elizabeth Neale, Charlotte Rogers, Jonathan Silver, and Jon Verrall will Skype in to do a special director & cast commentary during the watch through. Special guest, Amber Goldfarb who is joining the cast in season 2 as “Kat” will also drop by the stream. 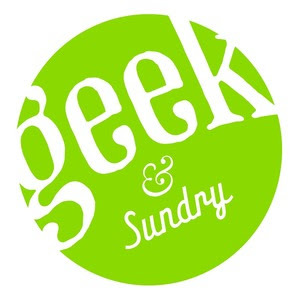 Geek & Sundry is a digital entertainment company recognized for providing the best in award-winning Internet television content featuring leading voices in geek culture and lifestyle. Geek & Sundry is part of Legendary Digital Network, a collection of next generation channels, which also include Nerdist Industries and Amy Poehler’s Smart Girls. Spearheaded by prominent geek figureheads including Felicia Day (The Guild, Supernatural, Dr. Horrible) and Wil Wheaton (The Big Bang Theory, Star Trek: The Next Generation), Geek & Sundry has launched fan-favorite shows such as TableTop, Co-Optitude, Written By A Kid, Spellslingers and Spooked which have earned them over 1.5 million subscribers and 140 million views. The network has also launched their Twitch Channel that received over 5 million minutes viewed within its first week of going live to further connect with the online community. Geek & Sundry has won multiple accolades and nomination votes from the Annual Streamys, IAWTV, Origins, Davey, Diana Jones and Producers Guild awards since launch. The office is headquartered in Burbank. For more information, visit www.geekandsundry.com and watch us on YouTube at www.YouTube.com/GeekandSundry.